It was a warm, sunny afternoon in Tempe, AZ as I walked with a group of GoDaddy employees on our way to lunch during Pressnomics 3 earlier this year. It’s the first time I met Mendel Kurland, Christopher Carfi, and Kurt Payne in person. During lunch, we discussed a number of topics from the efforts to change the company’s image, to ideas that help the WordPress community. I suggested to the team that GoDaddy create a billboard chart that shows the most popular themes and plugins used across its network. Not only would the information be beneficial to the company, it would also give the WordPress community valuable insight into what plugins and themes are used on a webhosting network with millions of customers. Nine months after our discussion, GoDaddy turned the idea into reality with the Hot 100. GoDaddy tracks which themes and plugins are activated across the millions of sites it hosts and puts the 100 most popular of each into a list. The list is generated each week and places the previous week of results into an archive allowing you to monitor trends. Similar to the Billboard Hot 100, you can see the current rank of a plugin or theme, whether it’s moved up or down, and what its rank was the previous week. With an influential list like the Hot 100, it would be easy to accept paid listings. Carfi, confirms it’s not possible to purchase placement. The Hot 100 is determined by ranking the net change in the number of active installs of WordPress plugins and themes in aggregate across GoDaddy’s hosting network. It looks at plugins and themes that are active at the time of the analysis and does not include plugins or themes that are deactivated. Instead of using the total number of active installs, the Hot 100 looks at the week-over-week change in active installs. This enables the list to determine which plugins and themes are hot or part of a rising trend. It also prevents bias towards plugins that already have a large install base such as Jetpack. Interestingly, themes on the list that are non-GPL are specifically noted and link to the Hot 100 instead of their corresponding theme page. In a post published to the Advanced WordPress Facebook group, Jeff King, Senior Vice President of Hosting at GoDaddy explains why. One great recommendation and valuable bit of feedback we received is that, since the community embraces GPL, we should reflect that ethos in the Hot 100 list. While some non-GPL themes or plugins may occasionally show up in the list due to the fact that some non-GPL items still exist in the ecosystem, we don’t necessarily need to link to them. As of next week, we’ll be removing links to non-GPL themes and plugins. Although WordPress.org provides stats for plugin and theme authors, you can’t determine where they’re being used. The GoDaddy Hot 100 gives the public and developers of popular plugins and themes an opportunity to see how well they’re doing on one of the largest webhosts in the industry. 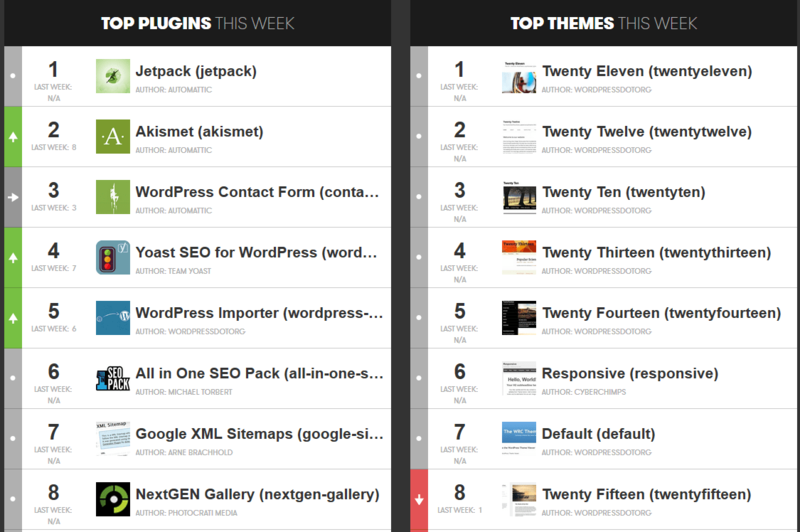 While Jetpack and Akismet are the two most active plugins and seven default themes make up the top 10 themes, it’s the 25th-100th rankings that I find interesting. For example, Hello Dolly which ships with WordPress and is activated by default after installation is ranked 27th this week. Last week, it ranked 38th meaning a lot of new installs of WordPress have taken place. This indicates that even though a lot of customers disable the plugin at some point after installation, it remains active on many sites hosted by GoDaddy. One of the largest jumps I’ve seen so far is the Image Widget plugin by Modern Tribe. It was ranked 95th last week and 31st this week. It would be interesting to know why a lot of new WordPress installs are activating this plugin on GoDaddy hosted sites this week versus last week. The Hot 100 is a valuable resource and I encourage you to see if your favorite plugins and themes made the list. Although it’s specific to GoDaddy, do you think the data is valuable? Would you like to see other large webhosting companies provide a glimpse into the most active WordPress themes and plugins used across their network?